The following steps may help relieve your heel pain. Use crutches to take weight off your feet. Rest as much as possible for at least a week. Apply ice to the painful area. Do this at least twice a day for 10 to 15 minutes, more often in the first couple of days. Take acetaminophen or ibuprofen for pain. Wear proper-fitting shoes. Use a heel cup, felt pads in the heel area, or shoe insert. Wear night splints. Your doctor may recommend other treatments, depending on the cause of your heel pain. 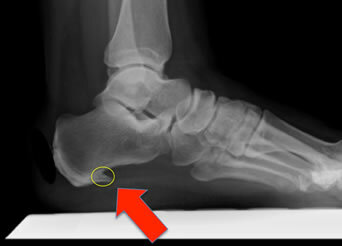 Call your doctor if your heel pain does not get better after 2 - 3 weeks of home treatment. Also call if your pain is getting worse despite home treatment. Your pain is sudden and severe. You have redness or swelling of your heel. You cannot put weight on your foot.